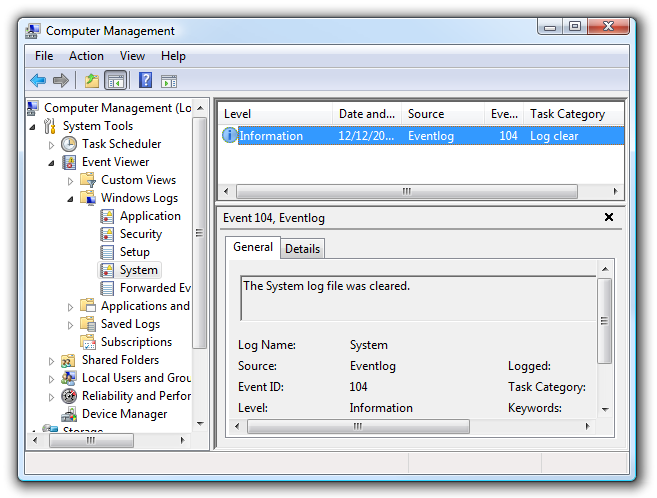 As any geek knows, one of the first things that you do when troubleshooting a Windows problem is look into Event Viewer’s Application or System logs, which typically are rich with information on what the problem is. But what if the event log itself is corrupted? 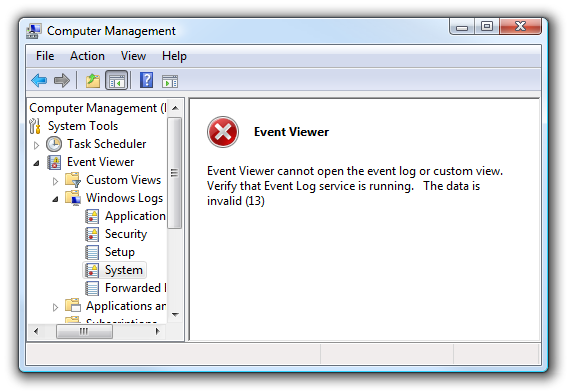 I came across this exact situation the other day, where I was getting the error “Event Viewer cannot open the event log or custom view. 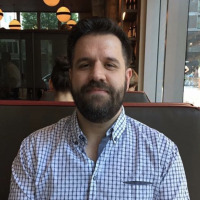 Verify that Event Log service is running. The data is invalid (13)”… but the error only happened when trying to open the System log, while the Application log was working just fine, and restarting Event Log or rebooting didn’t help. What you can do in this situation is clear the system log, saving it to a file in the process. This will usually “reset” the log so that future events will be viewable. You can right-click on any of the logs and choose “Clear Log” from the menu. You’ll want to choose “Save and Clear” when prompted just in case you need to access those events. Give the logfile a useful name, and then click the Save button to continue. 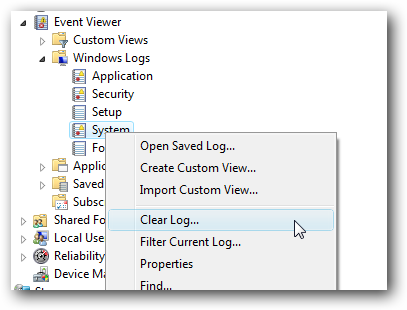 Note that you probably won’t be able to open the log with Event Viewer, but you could open it in a text editor and try and find some information in it. Now that I’ve cleared the log, you can see that I’m able to view the events in the System log again. Extra Note: The problem I was encountering ended up being because I had 9 USB devices plugged into a machine with a very pathetic power supply. Moving the devices onto a Powered USB hub fixed the problem, and I’ve since upgraded the power supply.